The number of churchless Americans has jumped by nearly one-third in just 20 years in spite of the frequent "Christian self-description of the United States, a new report had found. In the early 1990s, about two out of 10 U.S. adults were churchless; in the early 2000s, it was three in 10 and today, the churchless make up nearly half the adult population, the Barna group finds in its report distributed April 28. "In spite of America's 'Christian' self-description, there is a growing sense among North American Christ-followers that the culture is changing faster than we can keep up, with or respond to," the report says. The report, called, Churchless, confirms that the world has, indeed, altered in significant ways during the last few decades. The report also ranks the most unchurches cities in the United States. The California Bay Area takes the top spot when it comes to dechurched adults (48 per cent), ahead of: Seattle-Tacoma, WA (44 per cent); Portland-Auburn, ME (43 per cent); Boston-Manchester, MA (42 per cent) and Albany-Schenectady-Troy, NY (41 per cent). The real data confirm how drastically the moral, social and spiritual lives of Americans have changed and are changing. It also noted, "We're not always sure how to live faithfully in a world that feels like it's headed off the rails. "Not too many years ago, church attendance and basic Bible literacy were the cultural norm. Being a Christian didn't feel like swimming against the cultural current." Churchless finds the number of unchurched people in the United States is staggering. It says that most of what is counted as "church growth" is actually transfer growth, rather than conversion growth. That refers to people transferring their allegiance from one church to another, not transitioning from non-Christian to Christ-follower. "If churches hope to grow by discipling new believers, we must improve our ability to attract those who are intentionally avoiding a connection with a church," Churchless says. It's not all bad news for believers Churchless finds. Three-quarters of unchurched people own a Bible and 60 per cent of churchless adults prayed in the past week. Two-thirds of churchless say they tried to grow spiritually in the past month by talking with family and friends about faith or watching religious TV programming. Barna Group says it has conducted tens of thousands of interviews with unchurched people to discover their hurts, needs and hopes, with the aim of equipping the church to become more effective at connecting with them. 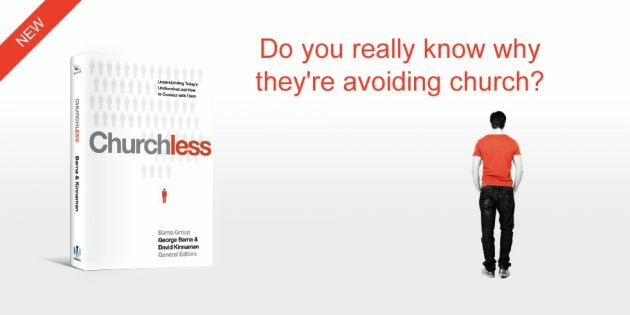 Churchless is an up-to-the-minute snapshot of the perceptions, beliefs, behaviors, choices, experiences, expectations and hopes of a nationally representative body of churchless adults. 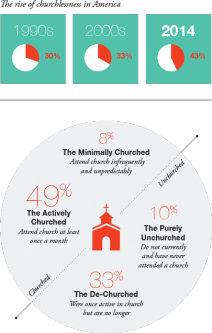 Based on Barna's data, Churchless compares the backgrounds, behaviors and beliefs of the churched and the unchurched. It also points to how people can build spiritually meaningful relationships with their unchurched family, friends, neighbors and coworkers. "Because the truth is, most of them are already looking for a connection with God," Churchless says.